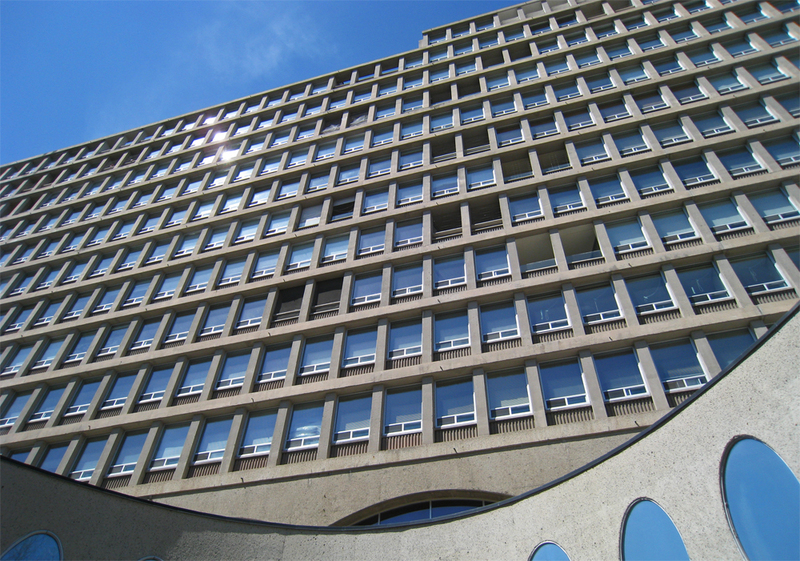 A landmark on Toronto’s Mink Mile, The Colonnade at 131 Bloor Street West became the city’s first modern mixed-use building upon completion in 1964. Architect Gerald Robinson (with Tampold & Wells) deftly combined residential, commercial and retail space to create a vibrant hub for urban living. The Colonnade’s layering of functions begins at sidewalk level. The two- and three-storey podium showcases a long row of storefronts, which curve inward at the two-thirds point to form an elegant oval entrance forecourt. Punctuating the forecourt is a sculptural concrete spiral staircase to the restaurant terrace above; at the time, the staircase was claimed to be the only one of its type without a central support. From the main lobby, an escalator ride to the second level reveals a high-ceilinged pedestrian street, naturally lit by arched clerestory windows and lined with shops, offices and restaurants. Giant oval portholes—a very Sixties design motif—offer views of the Victoria College grounds to the south. Rising above the retail podium is an 11-storey slab tower housing 160 luxury apartments and two floors of offices. Bi-level penthouse suites feature private garden terraces and swimming pools as well as panoramic views of the city and Lake Ontario. Externally, The Colonnade is defined by its exposed concrete frame, bush-hammered in places for surface texture, and precast spandrel panels. The tower’s waffle-pattern façade is based on a five-foot structural grid; perimeter loads are distributed to the broadly-arched lower columns by massive concrete transfer girders. The flexibility of the grid dimensions allows suites to be readily reconfigured to suit resident requirements and market demands. 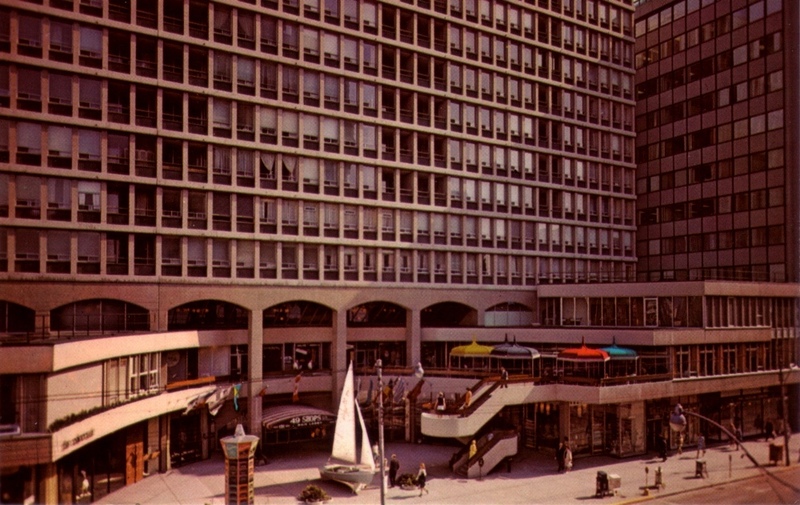 The image below, looking east from Avenue Road, illustrates the thoughtful integration of The Colonnade’s podium with that of the earlier Britannica Building next door. 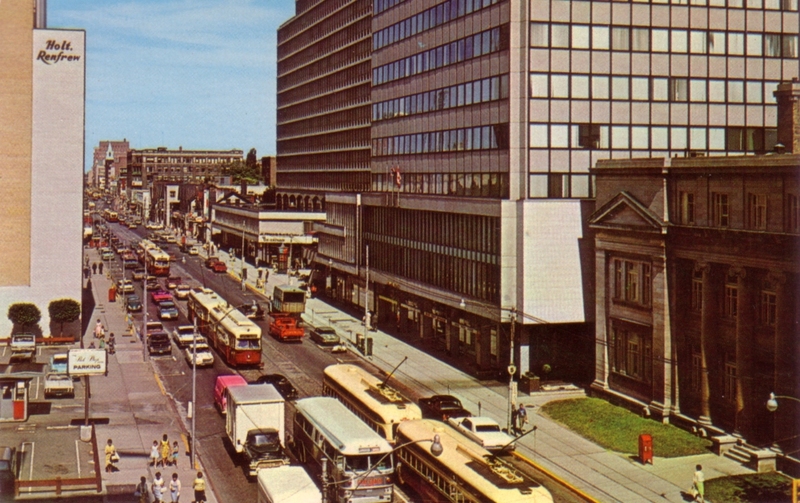 Also note the TTC streetcars on Bloor Street, soon to be phased out with the opening of the Bloor-Danforth subway in February 1966. An immediate critical and financial success, The Colonnade inspired a generation of mixed-use buildings in neighbouring Yorkville and other parts of Toronto. A glittery 1980s renovation has since been scaled back, allowing the building’s inherent qualities to once again shine through, and the streetfront is lined with Prada, Chanel and Cartier. Life is good.